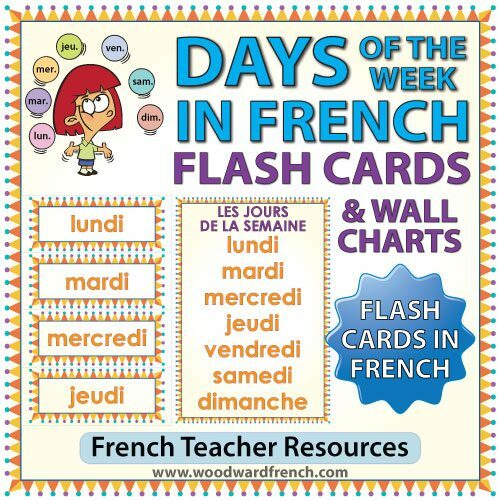 The flash cards contain the following words (and phrases): lundi, mardi, mercredi, jeudi, vendredi, samedi, dimanche, les jours de la semaine, les jours, de la, semaine, hier, aujourd’hui, demain. There are normally 4 words per page and there is a dotted line around each flash card for ease of cutting. We have also included a larger version with one day per page. There are also two charts, each one on a A4 size page. 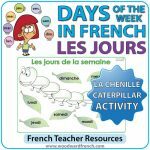 One version is a list of the days of the week written in French, the second chart is a list of the days of the week in French with the corresponding translation in English next to it. 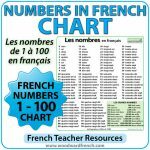 These can be printed in color to use on the wall or can be photocopied and given to each student. 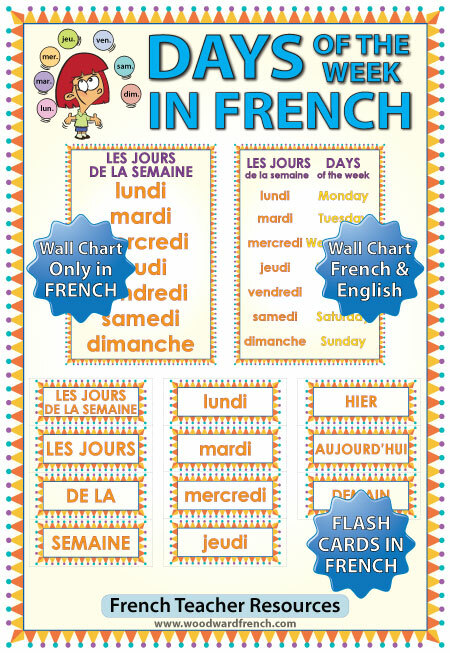 You may also want to laminate each cartoon chart and use them as large flash cards. Some teachers also photocopy these and make a booklet for students. Enter your email address to subscribe to Woodward French and receive notifications of new articles by email. Woodward French © 2019. All Rights Reserved.